Thinking about re-siding your home? Take a look at this eco alternative. 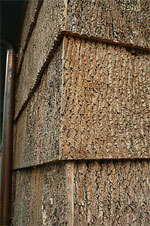 Just like a trees own weather proofing, these bark shingles insulate, protect, and are virtually maintenance free. 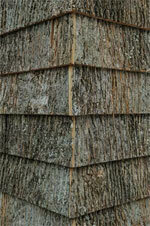 It is made up of tulip tree bark waste from timber operations that would otherwise get burned, mulched, or left to rot. Lasting up to 75 years, renewable, sustainably harvested and containing no chemicals, it is quite possibly the greenest siding on the market today. The textured look only adds to its appearance and acoustic properties, blocking out sounds much like another bark, cork. Bark shingles are nothing new- dating back millenniums in some societies, it first appeared in 1895 made from American chestnut trees in the southern Appalachian Mountains. 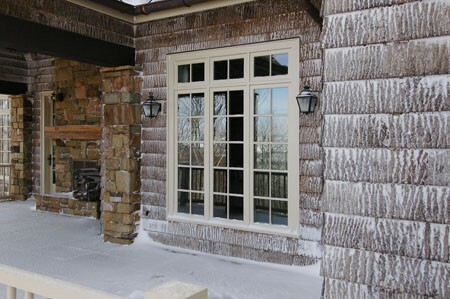 Some hand-trimmed slabs of two-inch-thick chestnut bark still exist today, untreated and in their original state in the resort community of Linville, N.C. Chestnut blight wiped out the main source of bark in the early 20th century making the practice all but extinct, but the resurgence of bark shingles today are made from Poplar. 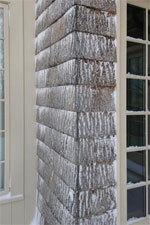 Installation is a bit more complicated and expensive than traditional cedar shingles, so be sure to consult an expert. Check out more examples of building with bark and uses from Barkhouse.com. Wow! That is one gorgeous alternative. I have to re-side the house next year and I’ll certainly look into bark.